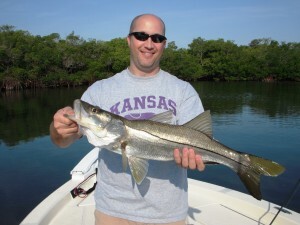 “Spring is here and the fish are biting on Tampa fishing charters. The trout bite continues to be outstanding. We are having days when you can catch as many trout as you want. We are fishing live shrimp and sardines under a cork using 25lb Berkley Trilene Fluorocarbon leader and a 1/0 Daiichi circle hook. Light tackle is the way to go. The spanish mackerel are here and the bite continues to get better every day. With the bait starting to show and water temps getting warmer, the spanish mackerel are here and offer a good fight. Often over looked by most, spanish mackerel offer good table fair. The key is to bleed them and get them on ice right away. They are good fried and smoked but I prefer them blackened. Along with the spanish mackerel, the king mackerel will soon follow. King mackerelare known for there fast, drag screaming runs. They can range for 7lbs to 30lbs plus. The snook bite looks like it is on its way to recovery. I am not seeing the numbers like we did in the past but I am seeing some nice fish. I haven’t been fishing them hard but had a trip with some decent fish caught with a 29″ being the biggest. We are looking forward to a good spawn season this year and should be headed in the right directions for recovery.